How Do Wrongful Death Claims Work? If someone dies due to the negligence or intent of another person, party or entity, the family or loved ones of the deceased may choose to file a wrongful death claim. A wrongful death claim is a lawsuit that’s brought against whoever is believed to be responsible for the death. These claims are often very difficult for a variety of reasons. Not only is the family is dealing with the loss of a loved one, but also these lawsuits can be incredibly complex and time limits may apply. A wrongful death claim can result from any type of fatal accident, ranging from car and truck accidents, to workplace accidents, product liability cases, and medical malpractice. A claim can be brought against multiple people, companies and government agencies that are considered to be at fault. For instance, a boating accident involving alcohol, speeding and faulty boating equipment may bring action against the boat driver; the person who sold alcohol to the impaired driver; the owner of the establishment that sold alcohol to an impaired driver; the manufacturer, distributor or installer of the faulty boat part; and the agency responsible for posting speed limit signs. 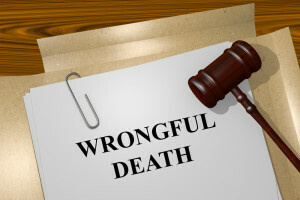 Those who can file a wrongful death claim include immediate family members, financial dependents, life partners, distant family members, and in some cases, the parents of a deceased infant. The purpose of a wrongful death claim is to hold the person or party accountable for the death, which not only caused the family emotional distress, but also loss of income, medical expenses, funeral and burial expenses, and so on. If you’ve lost a loved one due to the negligence or intent of someone else, you can file a wrongful death claim. Contact the Law Office of Daniel L. Crandall today for a free consultation: 800-LAW-8000. We specialize in personal injury and wrongful deaths claims and will fight for the compensation you deserve. This entry was posted in Uncategorized and tagged personal injury lawyers, wrongful death by admin. Bookmark the permalink. Copyright © 2019 Law Office of Daniel L. Crandall. All Rights Reserved.